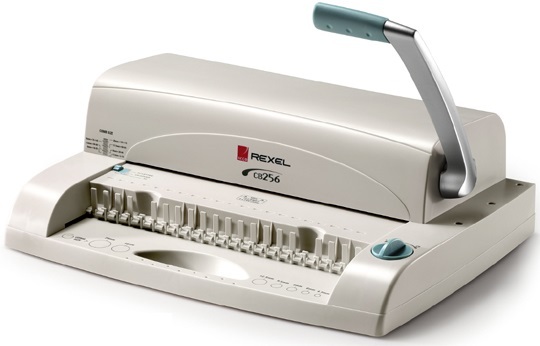 If you are looking for a light duty office comb binder then the Acco Rexel CB 256 comb binder may be just the machine. The CB 256 is a compact comb binder which will punch up to 15 sheets at a time and bind up to 170 pages into one document. It’s suitable for 5mm up to 20mm diameter combs (using the standard 21 ring comb). Use the Acco Rexel C256 to bind your A4 documents quickly and easily. The CB 256 is manually operated, but it also comes in an electrical model which is slightly heavier at 8.6 KG’s but has the same specifications and size. This is known as the Acco Rexel CB 256E.